I've been to Vietnam twice, both times by cruise, so I’ve never had enough time on land. I went straight for food each time our ship docked, but I rarely searched for food blogs beforehand because most of them were written by tourists. The locals don't really eat at these places, and neither do the foodies. In a small town famous for its food, you can’t really go wrong if you follow common sense, but in Vietnam, there aren't many recommended restaurants and few people speak English. What I did was simply trying the places that looked interesting to me. Luckily, most of the places I tried were very delicious, many tasted quite good, and only a few tasted just ok.
Da Nang looks like a country town, it has a peaceful atmosphere. People walk casually on the street. The pace of life seems slower here. What some people call “laziness” is called leisure here. It would be a pity for you if you didn't try pho here. In Vietnam, there is a saying that goes “rice is like your wife, but pho is your lover”, so you gotta try pho in Vietnam. We passed by a pho restaurant, it looked quite clean, so we walked in without hesitation. At first we planned to order only one bowl just to try. But we immediately ordered another bowl, it was so delicious! OMG, it totally changed my impression on Vietnamese pho, the ones I had before were simply no comparison. I ordered a bowl of chicken pho, which tasted slightly sweet with its fragrant soup. I found quite a few ingredients in the soup that made it very delicious. On the table there was a small basket of herbs (such as mint, basil and so on), a small plate of lime (vinegar is not used here, lime is used instead to give a sour taste), a box of chili paste and a small bowl of red hot peppers. You can add these according to your personal preference. With the right mix, your pho soup will taste even more amazing, freshness, sweetness, sourness and spiciness all together. It was not until I saw it in Da Nang that I knew that desserts could be packaged like an airbag. I didn't know snacks could look so interesting. I couldn’t guess what the ingredients were in the pots, not even after tasting them. Warm syrups were put into plastic bags with the opening tightened, the warm air couldn’t escape making the bag look like balloons. Seeing people carry such a bag on the street, you don't need to worry about if it contains something funny inside, it’s really just a unique looking drink. I saw a shop selling something similar on the corner of a street, so I walked in. I didn’t know what the drink was called so I just ordered one by pointing at it. It looked like solid cocktail with different layers of colors piled up in a cup. Luckily, there was an old man who could speak English. So I asked him a lot of questions about the drink and I was told to stir it before drinking. I stirred, but it still tasted too sweet for me. I could only taste the sugar besides the a bit of aroma from coconut milk and chestnut paste. I didn't have another sip because I’m not really someone with a sweet tooth. You can find the most authentic local foods in a neighborhood market. So I always visit local markets if my schedule allows me to when going to a new place. There I could buy local goods at affordable prices. After entering this market, Con Market, I didn't notice any vendors at first (perhaps because the entrance I came in from was a bit far), but I first came across two lines of food stalls with tables in front of them which looked like Japanese sushi bars. I was immediately attracted to the weird-looking dishes after I saw them. I sat down at a table as I started drooling in my head. I ordered a couple of items of different shapes wrapped in bamboo leaves. The lady shop owner winked at me as she tried to tell me how tasty they were.. I remember some tasted sweet, and some tasted salty. Then, the owner gave me a bowl of soup, it tasted a bit like the hot and sour soup, but thicker. When I was ready to pay, I wasn’t yet familiar with the local currency, so I took out all the Vietnamese dong bills I had and laid them on the table, and asked her to pick the bills for me. She took the exact amount, smiled and thanked me, she was such a kind and honest person. We walked further, and came across something familiar: Vietnamese fresh spring rolls. Compared with the ones I had seen in other countries before, these look a lot more natural. I pointed at the fresh spring rolls to the shop owner, then we were handed some rice sheets, vegetables and slices of boiled pork belly, together with a bowl of spices and sauces. Then we started making spring rolls ourselves as others looked over amusingly. We ended up eating 4, 5 super large rolls each, we even ordered drinks on top of the rolls. Tender and juicy pork belly wrapped in fresh green vegetables, what a pleasant combination. The fresh Vietnamese spring rolls I had tried in other countries had quite a few extra ingredients, like mango, shrimps, avocado, etc., prices were higher too; they might be yummy, but in my opinion they somehow lacked a bit of the original taste from Vietnam. I went to the ancient town of Hoi An on this second trip to Vietnam. The town was already quite commercialized, there were many tourists, food selection was diverse, and vendors knew how to sell. This particular western restaurant by the lake had an amazing ambiance. Their dishes were great too, mostly sour, hot or sweet in taste, their grilled meats were very tender. Their noodles are one of the local specialties, thick and cooked “al dante”, worth a try. In Vietnam, drinking coffee is very common. Coffee can be found everywhere, from specialized coffee shops to mobile food carts in local markets. For someone who loves plain black coffee like me, it’s a challenge to like a cup of coffee with sugar, cream, or condensed milk. Vietnamese coffee is quite bitter, its rough taste can still be felt even with added flavors during roasting. I don’t mean to say the coffee is inferior in quality, it’s just a bit coarse to my taste. The ancient town of Hoi An has well kept her historic and classic side, that is exactly why the town is so lovely. 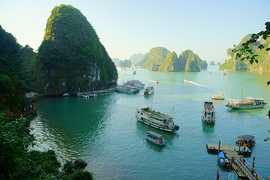 Ha Long Bay is located near the Vietnam-China border, many people here can speak some Chinese, the local tourism industry has been quite developed over the years. A year passed by since the last time I visited, beside the bridge that I once walked across, there is a new amusement park, the ferris wheel can be seen from far away. Ha Long Bay reminds me of Guilin in China, a unique scenery of thousands of hills on water. It’s a pity that it was raining when I came here this time around, but I knew at the bottom of my heart how beautiful and stunning Halong Bay was. If you take a boat tour in Ha Long Bay, expect vendors in boats approach you to sell fruits, they would stand with one leg in your boat and the other in their own boat, it’s quite an acrobatic scene. Our group went to watch a show at a local theater, in the middle of it myself and two friends who came to Vietnam for the first time decided to sneak out and get some nice pho soup. Luckily we saw a pho restaurant on our way to the theater earlier, so we went straight there. We order a bowl of chicken pho and two bowls of beef pho. The chicken was boiled and shredded, it looked yummy; the raw beef was cut into slices and placed onto the pho noodles, with a bowl of hot soup poured on top, each slice turned color but the inside was still pink, they were really tender. Even without adding more ingredients like chilli sauce and lemon, the soup tasted so fresh and appetizing. This market is next to a large shopping mall, its aroma of fried seafood can be smelled from hundreds of yards away. I got closer, saw a food stall and two people smashing something in a pot using clubs, I thought they were making glutinous rice cakes. Then I peeked in, it was something white and sticky, with its seafood smell, I realized that it was paste made from squids. Once the raw squid paste was prepared, the next step was to make them into shapes of a small pie, then deep fry them. Seeing how fresh these were made was so much more enticing than seeing the end product. I couldn’t resist my temptation, I bought half a kilo right away, it costed about $8. As we were standing in front of this cart, it didn’t matter how elegant of a lady we were before, at this moment we all became ugly eaters. We couldn’t wait for the freshly fried squid pancakes to cool first, each picked up a piece and start eating right away, some screamed too hot, it was such a funny scene. The kind owner handed us napkins so that our hands wouldn’t be burned. The chewy texture of squids tasted amazing after being fried, if I had a bigger stomach, I would certainly stuff more squid pancakes in it now! As we were ready to leave, I saw a push cart that was selling coffee, I bought a cup of iced coffee right away. A guy friend in our group didn’t listen to me, insisted in trying hot coffee, well guess what, it was too bitter for him, then he switched to iced coffee again. This type of push cart coffee is usually prepared in advance, it’s not brewed on the spot, so its taste is naturally not very rich, but since it’s quick and cheap, I don’t complain. Besides fresh seafood and dry goods, you can also find baguettes and homemade style stir-fry in the market. We didn’t see pho soup or Vietnamese vermicelli in the market though, and since we planned to go back to our hotel for lunch so we didn’t keep looking. I didn’t find the food in this fancy looking hotel any extraordinary, the seafood dishes offered nothing more than just the regular sweet/hot/sour taste, pho and squid pancakes couldn’t even compare with the ones I bought on the street. Ho Chi Minh City used to be called Saigon, it was once the capital of South Vietnam before the unification, some people even gave it a nickname “Paris of the East”. Like a couple, one tends to be influenced by the other in a lot of ways, even after they break up. As a former French colony, the French culture and traditions can still be felt until this day, especially in Ho Chi Minh. Push carts full of French baguettes ("banh mi") are very common, they give this city a distinct and classic character. Banh Mi is a kind of sandwich that consists of a Vietnamese style single-serving baguette. I bought one, it was split in the middle, stuffed with vegetables, sliced sausage and other ingredients. I tried to ask the shop owner what exact ingredients it contained, but unfortunately we had a language barrier. Vietnamese banh mi looks golden and tastes crispy on the outside, its inside is a bit tough and chewy, I loved that it smelled the aroma of fresh wheat. Cha Lua (or pork sausage), cilantro, and I guess pickled radish were the filling, together with a secret sauce, my banh mi tasted amazing! It’s such a great fusion of Vietnamese and French cuisine. Among all the coffee shops in Vietnam, Trung Nguyen Coffee chain is probably the most well known. The one I went to had three floors. The first floor was an open-concept retail shop, they had their own brand products, like drip filter pots, coffee beans, ground coffee, etc. I bought some for each, and I like the drip filter pot particularly, it has a quality feel to it, every detail is well crafted. Then I went to the second floor for some coffee, their coffee beans were very fresh and high quality, taste better too, well, they were pricier too. I would recommend buying a well known brand like theirs, and not coffee beans stored in large gunny bags found in local markets, even though the beans might look glossy and large in size. Like I said earlier, I like to shop at local markets, everywhere I go, even for breakfast early in the morning. The markets in Ho Chi Minh are cleaner and bigger than those in other cities. I finally tried Vietnamese vermicelli in Ho Chi Minh. This dish is much more than just its good look, the cooking process is quite special. Seasoned meat is charcoal grilled while vermicelli is being prepared. Then the meat is placed piece by piece on to the vermicelli as they are cooked. The light sweet-sour taste of Vietnamese vermicelli makes it a good option for people who look for something refreshing. Choices of meat are usually available, such as meat skewers, meat balls, sliced meat, etc. I was constantly enticed by the smell of grilled meats as I was eating my vermicelli, I ended up adding more and more meat to my order, a simple meal turned into a feast. All kinds of appetizing fragrances from different food stalls, welcome to Vietnamese markets. We walked out after touring the market, it still felt pretty hot even though it was already December. Seeing a shop selling freshly squeezed sugarcane juice was like having found a treasure chest. I thought it was just regular juice, but who knew they even added milk in it, it tasted so good! Not too sweet, but so refreshing! My Vietnam trip wouldn’t be complete if I didn’t come across this sugarcane juice. The most memorable pho soup I had was at this restaurant by a pier. I had a glass of margarita onboard my cruise, then got off to look for more food. I always have more appetite at night than during the day, I can never fall asleep with an empty stomach. The taste of a good pho soup with beef entrails can always make me drool. Soft beef tendon, sliced beef cooked medium rare, juicy beef brisket, spiced meatballs, rich beef bone soup… yummy! This bowl of pho brought everything I knew about pho to a whole new level. Its delicious taste is simply unforgettable. I’ve always wondered when I would have another chance to try it again. When I went to Ho Chi Minh for the first time, I tried to eat less onboard my cruise so I could experience more local food on land, I even skipped the fancy Italian food on the cruise. After we docked at a port, we walked so far but didn’t find any restaurant or street food, we eventually saw one and went in, even though there wasn’t any customer in the restaurant we just didn’t want to look anymore, we were so hungry. All of their dishes on the menu looked colorful and yummy. I ordered a plate of stir-fry vermicelli, but the taste was a bit bland, even though there were quite a few ingredients: eggs, shrimps, pork. I was curious about the dish my friend ordered though, it looked like bowl-shaped cake made of minced meat mixed with eggs and green onions. I took a bite, it was actually fancier than I thought, there were small shrimps and shrimp paste in it. It had a bit of a fishy smell, but it tasted good. I guess for people who live in a coastal city like myself, we don’t really mind the fishy smell, I sometimes use fish sauce when I cook at home too, I enjoyed this dish. These fried spring rolls weren’t good though, the center was still a bit frozen. At last, I want to mention this pretty famous 24-hour pho restaurant chain. For me, the soup base didn’t taste as rich as some other ones I had before, but I guess it’s understandable considering the restaurant runs 24 hours a day, so they probably have to add water to the soup from time to time and that ends up diluting the taste a bit. This chain rice noodle shop is well known in the local. The good things about this restaurant are: they are always open, so you can always find them when you are hungry, and also their menu has many items so you have plenty of choices, their service is pretty good too, and most servers are young people so their English level is relatively better. Here this is, my foodie journal about my most recent trip to Vietnam. My admiration for the country comes from my love for their delicious cuisine. I’ll visit again, probably in the near future. I believe I’ll have even better encounters, and I’ll definitely share with you my adventures again. See you all soon!